HOSTILITY will officially be unleashed upon the masses in 2006. This band has the frenzied pace, unbridled passion and sense of unity you rarely find in music today. 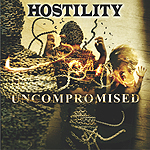 HOSTILITY is set to release their debut album Uncompromised (The Pen/Voltaic Records) on September 12, 2006. Mixed by Colin Richardson (Slipknot, Sepultura, Machine Head, etc. ), this album is pure, unadulterated metal at its finest. The press agrees. HOSTILITY has been called “Heirs to the U.S. thrash throne” by Metal Hammer magazine, and “On a one to ten scale, a definite ten” by Pit magazine. HOSTILITY is: GREG HARAN (vocals); TONY VORRISES (guitar); BRANDON SIGMUND (bass); and ANDREW HOLZBAUR (drums). Influences include metal titans Pantera, Sepultura, Machine Head and many others, as well as death metal legends Cannibal Corpse, etc. HOSTILITY is unstoppable – prepare yourself for the rage, or get the hell out of the way…! Chatting recently with guitarist Tony Vorrises, and noting that in their press that it had been stated that they were a bunch of guys that were first old school friends - and knowing that being old school friends is rather like being brothers - I first wondered if being that close within the confines of a band had any real negative points? "The band has been the same 4 guys for 8 years now and friends for even longer. You're exactly right, we're like brothers. Which means ya' know, you get in an argument, whatever, go drink some beers play a killer show ... and it blows over!" And with your music being described as "pure, unadulterated, in your face metal," I'm wondering just how Hostility aims to stand out from the metal crowd out there today?! "It's all about our live show, 150% all the time. Bottom line. Not too many bands out there are bringin' it straight heavy and really livin' it. I don't know, come see a show and party with us and you'll see what I mean!" For the Average Joe who may not have heard of you and was thinking of buying the upcoming CD, how would you yourself describe your sound? "Heavy as hell! 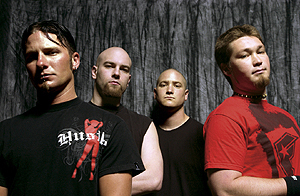 Groove metal. If you want some music that'll bring out that inner rage pick up the album!!" Your debut album title 'Uncomprimised' is an interesting choice, but is it born of a more personal nature for you, perhaps? "It just means we didn't and never have compromised anything we've ever done. It's directly from our hearts. The label wasn't looking over our shoulder in the studio, we went in and made the record we wanted to make." If there was one track on this new album that truly encapsulated Hostility their musical and lyrical finest, which one would it be? "That’s almost impossible to answer, every song has a different direction. There is a constant though. Every one of those f**kers goes for the throat!!" OK, so just where did the bands name originate ... and what else could it so easily have been?! "Back when my drummer and I started this band we were 14 f**kin' years old. I just wanted a name that when you heard it you instantly knew it was a brutal metal band. I thought of it and it stuck. I think it’s worked out well," he laughs. If you could cover any '80s (possibly cheesy!) pop song, which one would it be ... and why?! "No cheesy pop songs in our future!" Lastly, I like Penguins ... do you?! "What the f**k??" If you would like to win an AUTOGRAPHED copy of Hostility's new CD, just answer this easy question: Hostility formed in 1998 while still in high school ... but which one in which city in which state? !